This shockingly simple Italian potato gnocchi recipe uses a surprising shortcut (instant potato flakes) to avoid the problems of getting the potato-to-flour ratio correct. 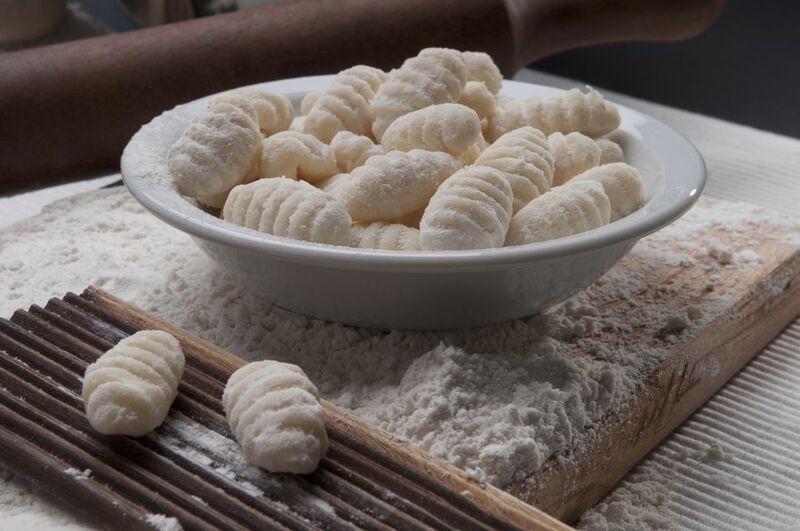 If there is too little flour, the gnocchi might disintegrate completely in the pot during cooking, leaving you with nothing but starchy water. If there is too much flour, on the other hand, they can turn out too dense and hard. But not with this recipe! Double, triple, or quadruple it with good results. Gnocchi work very well with smooth, creamy sauces, such as pesto, a simple walnut sauce, a creamy tomato sauce, or a four-cheese sauce. Place the water, beaten egg, butter, and garlic powder in a food processor and mix at low speed until combined. In a large mixing bowl, combine the potato flakes, flour, parsley, and salt. Add the potato flake-flour mixture to the food processor and mix at low speed until a dough forms. Flour your hands and work surface and gently knead the dough, then roll it out flat. Cut the dough into strips and roll the strips into ropes. Cut the ropes into bite-sized pieces and roll each piece on a gnocchi board or along the tines of the fork to create a ridged pattern. Boil in salted water for about 1 to 3 minutes (when they float to the surface, they are ready). Drain with a slotted spoon, rather than a colander, because they are a bit delicate. Toss gently in the sauce of your choice. You can play around with the dough by adding grated Parmigiano-Reggiano cheese, minced sun-dried tomatoes, spinach, or whatever takes your fancy. Industrially made packaged gnocchi (particularly the kind that are not refrigerated) are often quite dense, sticky and gluey, with little potato flavor, but fresh, handmade gnocchi are completely different: light, delicate and pillowy, with a much more subtle and authentic taste.